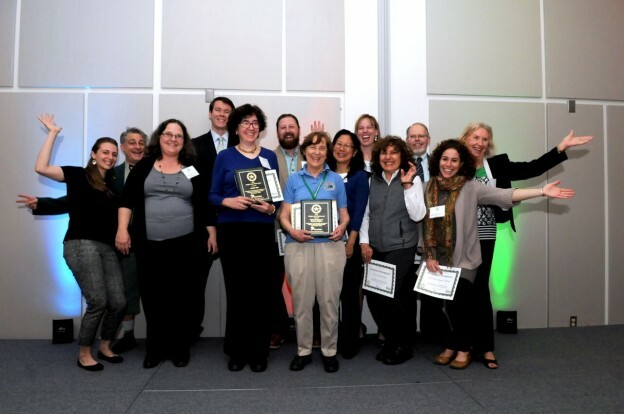 It was a clean sweep for Virginia Cooperative Extension at the George Mason University Go Gaga for Green awards for its efforts promoting environmental sustainability. VCE staff and volunteers won in all three award categories, Individual, Organization and People’s Choice. Extension Agent and Unit Coordinator, Jennifer Abel, was awarded the Arlington Green Patriot Award for her sustainability efforts both professionally and personally. Jennifer actively volunteers for several local environmentally focused organizations including the Mt. Vernon Group of the Sierra Club and ACE R4 task force. In 2011, Jennifer co-founded the award winning Energy Masters program. In the five years since its inception, more than 150 volunteers have retrofitted almost 600 low income apartments to improve energy efficiency and reduce tenants’ utility bills. The program now operates in both Arlington County and the City of Alexandria. To learn more about the Energy Masters program, visit http://bit.ly/VCEEnergyEfficiency.